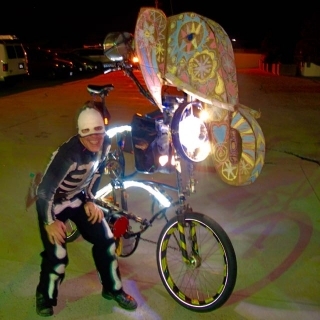 Hallowheels 2015 was a trumpeting success with one new ship, one new pilot, an infestation of maggots, a tower of flame, and countless high-fives (which were dutifully counted). Taco's long game came to an exciting conclusion with a pizza costume. As it turns out, tacos are basically just folded pizza. The fleet admiral crafted a Pastelephant hull-helm for Cloudbuster. Rocket provided pachydermal sound effects on remote-actuated trumpet. Ichirinsya christened a new single-thruster ship, Pimpmobile, while sporting appropriate battle dress. Threespeed demonstrated and then promptly broke, fixed, and re-demonstrated a new plasma-powered flamethrower trailer. Dozens of exuberant civilians clad in all manner of strange alien garb greeted an enormous friendly fleet (also clad in alien garb) in the Davis constellation not once but twice on the way to a stop rations and chalk graffiti in the Central constellation. Amethyst was finally (finally), finally knighted amid a burst of flame and a fabulous hat. For those who burned up on reentry, we salute you.